Whilst product development occupies a unique environment and status within the organisation, waste can still be quantified and eliminated just as it is with more conventional manufacturing processes. With 75%-80% of total development costs accounted for by the early stages of product development, it is clearly crucial that all of the correct decisions are made before committing to those costs. In this way, an end product is produced that meets or exceeds – without over-exceeding – customer requirements, whilst avoiding unnecessary waste in its creation and development. 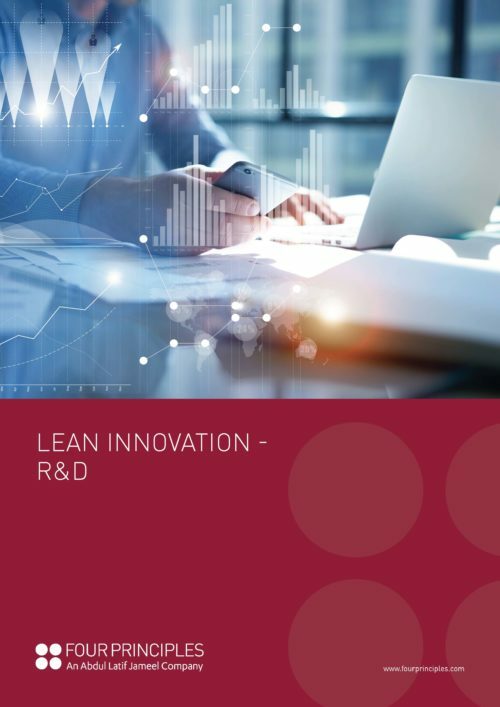 Lean management in innovation and R&D helps avoid resources being wasted on the development of ill-conceived and over-specified products or services, thereby developing products that are better aligned to market requirements. Better still, by reducing lead-times, products can be launched and establish market share ahead of competitors who operate with slower, more ungainly and wasteful R&D functions. However, the key challenge lies in balancing Lean management’s scientific rigour with the creative process – fostering a vibrant, fertile environment where creativity can thrive and innovators are not deterred from thinking outside the box. By its nature, innovation is all too often governed by “gut feeling” – this instinctive imperative must be retained but reduced and counterbalanced by standardised process that enables a more efficient and scientific evaluation of new ideas. Frequently working with highly innovative pioneers in their respective fields, Four Principles have extensive expertise in implementing Lean thinking and processes in the R&D and product development functions. From inventory, transport, handling and movement to over-production, over-processing and unsynchronised processes, Lean innovation and R&D can become the springboard not only for market-leading product and services, but also sustainable long-term profitability.